Today’s feature is Ms Chicoro and she has natural hair. Ms Chicoro is the author of the Amazon’s #1 Best Seller, Grow It: How to Grow Afro-Textured Hair to Maximum Lengths in the Shortest Time. Ms Chicoro provides training, coaching and mentoring to women that want to grow long, lovely hair. Grow It walks you through an easy six step process to help you understand what is helping and hurting you on gaining healthy hair. I started my hair journey when I was 14, after getting my hair cut for graduation. What is your current length? My current length is about 2 to 3 inches past my waist. I would like it to get back to hip length, thick and full. 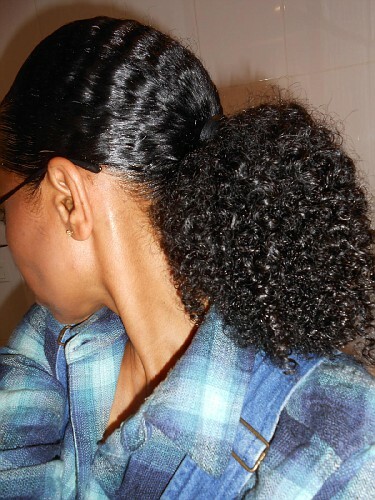 I wash my hair 1x per week and use inexpensive but mild shampoos and conditioners. I do pre-poo treatments and use leave-ins after styling. I use heat 1x per year and trim as needed. I like the shine on my hair and dislike tangles. No, I do not take supplements or use growth-aides. I like my k-cutter because it helps to detangle my hair. Thank You Ms Chicoro for the Lovely Feature! She is truly a beautiful person with gorgeous hair! I first heard of the LOC method from Chicoro long before the term LOC was coined. Haircare Pioneer. Most of my haircare practices stem from her expertise. Awesome woman, Beautiful Hair :)! When my hair grows up, it wants to be like my fine hair idol’s Ms. Chicoro!